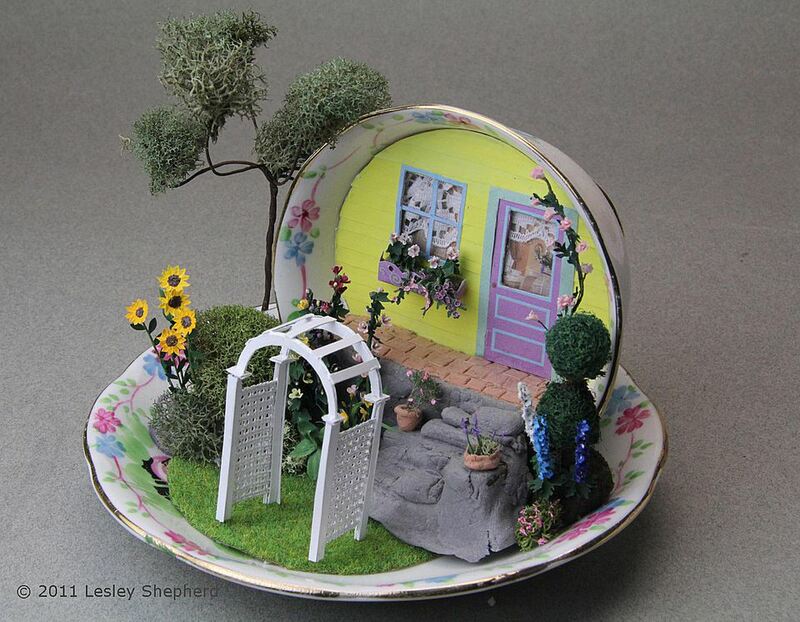 This arched top garden arbor can be made as a printable for smaller dollhouse scales of 1:24 or 1:48, or the printable can be used as a plan for a 1:12 scale arbor built from craft wood, illustration or Davey board (bookboard). The arbor is designed to represent either a four-foot-wide walkway or gate arbor in full scale, or a six-foot-wide arbor to go above a bench. The arbor can be made with printable sides, or you can use needlepoint canvas for the latticework as is shown in this 1:48 scale example. Note: - if you wish you can build this arbor out of craft wood. I set the upright posts to be equivalent to 4-inch square posts in full size, so you will need square stock on that scale. The arch will need to be cut and filed from a section of wood large enough to accommodate the arch. If necessary the arch can be made in two or more sections and glued together. Lightweight Card or Paper - I printed directly on lightweight matte photo paper for the 1:48 scale version of this arbor, but you can also print on paper and glue the paper to lightweight card from boxes or illustration or bookboard. Needlepoint Canvas - Optional - I used 11 mesh per inch canvas for this 1:48 scale version, you could use plastic canvas for larger scales. Paint Brush - for painting the canvas you will need a stiff bristled brush, a softer brush is better for painting the pieces of the arbor. To prepare the needlepoint canvas to act as the trellis on the sides of a miniature scale garden arbor for a dollhouse scene, cut the canvas to a width and length close to the size indicated in the arbor printable. Cut close to the upright threads in the canvas in order to help prevent fraying of the cross threads. Use a stiff paintbrush and thick tube acrylic paint to completely coat the needlepoint canvas without stretching it out of shape. Use the brush, or a pin, to clear paint from any of the holes in the canvas, so that it will resemble trellis. When the canvas has been painted, hang it from a clip to dry thoroughly. Press it flat and line it up square along the edges if necessary. When the canvas is dry, trim it to the size indicated on the printable for your particular scale. If you want a deeper arbor than the one shown on the printable, cut a wider section of needlepoint canvas for the sides of the arbor. If you are making the garden arch in a small scale from printed card or photo paper, you will need to build up a sufficient thickness of paper so that the sections resemble wood in thickness, and have enough stiffness to stand upright. For the 1:48 scale arch shown, I glued four arch layers together for each of the two arches I needed to build the arbor, and I glued three post layers together to form each side of each of the four posts. The number of layers you need to glue together will depend on the thickness of your card. You can either glue one printed section to several layers of card which have been glued together and allowed to dry, or you can cut out and assemble the printables in layers. The first method gives you a neater finish. Whichever method you use, allow the glued layers to dry before you attempt to trim or cut them out. If the glue is not fully dry, you will shift your layers creating uneven cuts. To assemble the sides of the printable miniature garden arbor, glue three or four layers of each post together. You will need four post sections for each side of the arch. Lay your trimmed needlepoint canvas (or trellis printable) on a flat surface, and glue a post section to either side of the needlepoint canvas so that the post legs are equal on either side of the canvas at the bottom and the top (see photo). The post edges should completely cover the edges of the needlepoint canvas or the printable trellis. Use a pen or a brayer to roll over the post sections, gluing them firmly to either side of the canvas section. Flip the canvas over and glue two post sections to the other side of the canvas, sandwiching the canvas between two post sections. Roll the post sections or press down on them firmly so they stick together along their full length, holding the canvas section or printable trellis between them. Set the two completed side sections aside to dry. When the sides are glued firmly between the post sections, cut out another printable section of a post, and glue it across the end of the arbor side, covering the join where the canvas or printable is sandwiched between two sides of a post. This will give you a clean front or back edge on each of the sides of your arbor. Make sure the covering section is glued securely and squarely to the front of one and the back of the other side post on either side. Set the sides aside to dry. When the sides are dry, cut small squares of your card and glue them together to make post caps which will overlap the top of your post on all sides. Trim your posts so they are exactly the same height, and glue the cap sections across the tops of the posts. I needed to glue four layers of photo paper together to make caps for the tops of my posts as shown. Set the side sections aside to dry. To join the sides of your miniature arbor together, brace the sides with a rectangular brace to line them up and hold them upright. For my quarter scale arbor, I used erasers to hold each side upright. Check the alignment of your sides by looking at them from the front and from above. When the sides are square, glue the base of the arch to the top of the post cap on both sides, making sure that the arches are as upright as possible, and line up with the centers of the front and back posts. Leave to dry thoroughly. To hold the arches in position across the top of you miniature arbor you will need to glue a series of strips across the tops of both arches. Build the strips from layers of card the way you built your posts. The brace strips I used were two layers of card thick. Cut the braces close to the length you need to cross from the front of one arch to the back of the second arch. Glue one brace across the top center of the two arches, then glue another brace spaced slightly above the posts. Make sure you keep the arches evenly apart as you glue the braces to the top of the arch. Allow the arbor to dry upright with these three braces across the top, then add an additional brace on either side of the arch. If you are building the wider arch to go above a bench you will need more brace sections. Allow the braces to dry. When the glue on the braces has dried, trim any protruding sections of brace from the front and back edges of your arbor. Carefully paint the arbor, taking care not to get your card layers waterlogged with thin paint. Allow ​it to dry. To finish the miniature arbor you can cover it with scale climbing plants. Plants must be grown up from both sides to completely cover an arbor. In nature, they will not bend down over the arch without being tied in place as they use the arbor as a support to grow towards the sun. To plant a scale miniature arbor, begin by arranging your longest sections of climbing plants (here a quarter scale rose) up the sides of the arbor and at least 2/3 of the way across the top. You should position your arbor in your landscape before you begin planting it, as you will need to set some of the plant stems into your 'ground'. Use climbing plant strands of different lengths to grow up and over your arbor, making the growth fairly thin from the ground to 1 scale foot up, then gradually thickening the plant matter. Spread it naturally across the sides of the arbor, and put most of the flowers on the top (they usually bloom much better in full sun on the top of the arbor).